KUALA LUMPUR: The halal industry in Malaysia attracted investments worth RM10.6 billion in 2015, comprising RM5.6 billion in foreign investment and RM5 billion in domestic investment. Deputy Prime Minister Datuk Seri Dr Ahmad Zahid Hamidi said the foreign investors were from the US, Japan, Italy, United Arab Emirates, Taiwan, the UK and Singapore. He said local halal products would continue to command strong interest among consumers worldwide with exports worth RM42 billion last year from RM38 billion in 2014. “Much of this revenue was derived from exports of halal ingredients, food and beverage products, and palm-oil derivatives. “Our key export markets, include China, Singapore, United States, Indonesia and Japan,” he said when officiating the Halal Cosmetics and Personal Care Products Industry Forum here today. Besides the food and beverage sector, Ahmad Zahid pointed out the need to explore the potential of a wider spectrum of the halal market, including services, banking and insurance. Ahmad Zahid said Malaysia was well positioned to maximise its potential in the halal sector, including halal cosmetic and personal care products. He said the diversity of the nation’s flora and fauna presented vast opportunities to be used in advanced sciences and biotechnology to develop more resource-based bio-generic products. “We have made significant breakthroughs in developing palm-oil based technologies where a significant portion of animal-based oils can be substituted with palm oil-based products. “Halal alternatives made from palm oil such as coenzyme (Q10) and halal emulsifiers are largely used in the industry. “What is needed is more intensive research and development (R&D) and more innovation to find halal alternatives using palm-oil derivatives to replace non-halal sourced ingredients,” he said. 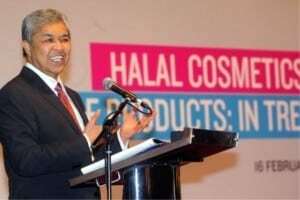 Ahmad Zahid, who is also Halal Malaysia Council chairman, said the Malaysian halal cosmetic and personal care industry performed reasonably well over the years as exports increased from RM1.3 billion in 2010 to RM2.3 billion in 2014, representing an average annual increase of 20 per cent. Ahmad Zahid said while Asia remained Malaysia’s strongest traditional market for halal products, the US, with eight million Muslims, and Europe, with 40 million Muslims, presented vast opportunities for the market to grow. “According to Euro monitor, this market was estimated to be worth more than US$454 billion in 2013. “Even if, conservatively, we estimate the demand for halal cosmetic and personal care products at 10 per cent of this global market, that would mean a market of at least US$45 billion,” he said. As the potential is enormous, he said it made business sense for industry players to seriously consider halal-compliant processes and products. Ahmad Zahid urged the private sector to continue to intensify investments in new areas, upgrade existing facilities, step up research and development, acquire new technologies, and enhance marketing and promotion activities. “It is my hope to see the private sector to drive the development of this industry to ensure Malaysia’s continuing leadership in shaping the global halal industry,” he said. Former prime minister Tun Abdullah Ahmad Badawi and International Trade and Industry Deputy Minister Datuk Lee Chee Leong were present.